The building was to be 16 by 12 [feet] and composed of split slabs and shingles with sawn floor and battens… My father gave us permission to take what timber we wanted free of charge, so we set to work and very soon had all slabs, shingles, rafters, etc., ready for hauling. The timber referred to here was taken off the Foreman property, which then included the area now occupied by Old Petrie Town. Charles Hay (who later married and raised his family in the cottage at Rush Creek subsequently known as Hay Cottage) assisted by using his horse team to cart all the timber to the site, including some sawn timber purchased from Pettigrew’s Sawmill in Brisbane. 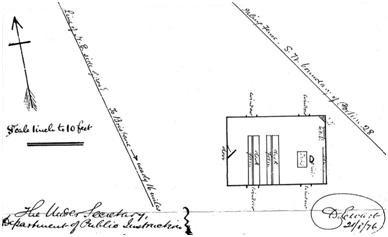 The notes accompanying this plan contradict Foreman’s memory by stating that the building was 20 x 14 ft. Courtesy of Education History Services, Queensland Dept. of Education and Training. It is known that Jacob Nathaniel Jonas, the first teacher, and his successor, Robert Lowry, taught during the morning on the southern side of the North Pine River. After riding or rowing across the river, the teachers conducted an afternoon school in the River Reserve. The building was not only used as a schoolhouse; it also served as a church and a public hall for the conduct of all kinds of meetings and social events.